We are big fans of Kevin Henkes’ books – I actually remember reading Chrysanthemum as a kid when it first came out in the early 1990s. I could relate to the little mouse who loved her name until others teased her at school. 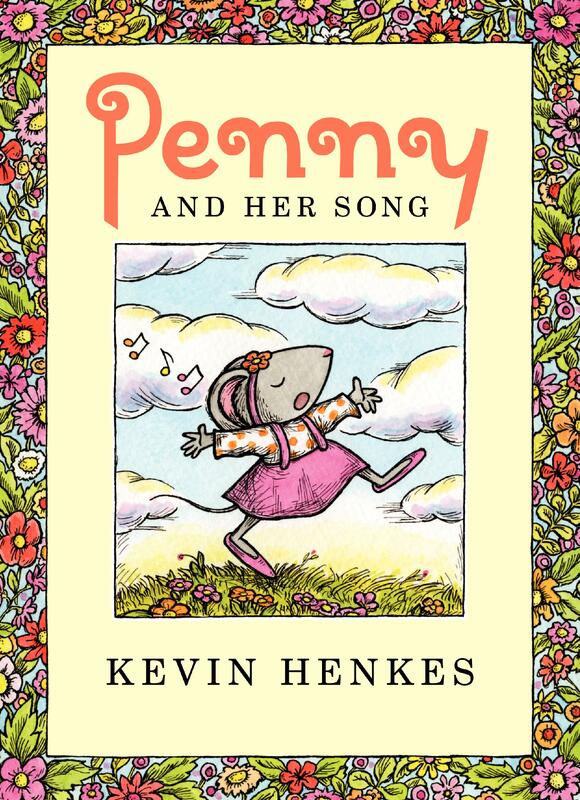 So when a routine library search yielded new Henkes early chapter books I had high hopes and am happy to report the “Penny” mouse books do not disappoint! There are currently 3 books written & illustrated by Kevin Henkes in this series. They need not be read in any particular order but are: Penny and Her Song, Penny and Her Doll, and Penny and Her Marble. In Penny and Her Song, Penny cannot wait to sing a song she has composed. Worried that she will forget the words, she attempts to sing it to her family but has to wait until after the twins’ naps and dinner. When she finally gets to sing her song her family not only learns it but puts on a show with her in the living room. 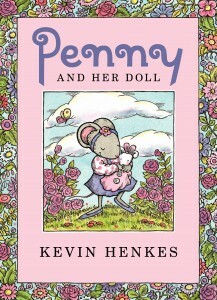 In Penny and Her Doll, Penny can’t decide on a name for her doll until she stops worrying about it so much, at which point the name comes to her. In Penny and Her Marble, Penny find a beautiful marble but feels guilty for not making sure whether someone had lost it before she claimed it. When she returns the marble to where she found it, her neighbor tells her she placed the marble there in hopes that someone would find it and enjoy it. Her conscience eased, Penny can truly enjoy her discovery. The books are charming, beautifully illustrated, and feature stories children can relate to. I love the details about the little mice and their world and feel that these would be a great choice for veg families. In Penny and Her Doll, for example, gardening features heavily. In Penny and Her Marble there is an illustration depicting eggs involved in cookie making but in the same book Penny’s dinner is shown as being just bread, peas, and salad. The mice in all of Kevin Henkes’ books of course eat cheese. Highly recommended and fun to read aloud, together, or alone. Ages 2 and up. Kevin Henkes is a genius…his little mouse characters are EXACTLY like real children and so relatable. His books are wonderful read-alouds and his illustrations are fabulous. We pretty much reserve any books he has at the library on a rotation, Lily (who appears in several books) especially is a relatable character and I love how her teacher is depicted. Penny touches on the younger crowd which I appreciated as an addition to his character set.